Since its early days as a shipbuilding center, Baltimore's Inner Harbor district has been a highlight of the city. Today, the Inner Harbor at Baltimore is nationally recognized as an example of urban transformation. 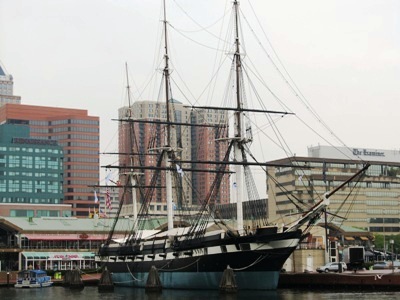 The Inner Harbor is home to many of Baltimore most famous attractions. Located nearby are Camden Yards, The National Aquarium, tall ship Constellation, Submarine Torsk, Coast Guard Cutter Taney, Chesapeake Lightship, Seven Foot Knoll Lighthouse, Maryland Science Center, Reginald F. Lewis Museum of Maryland African American History and Culture, Geppi's Entertainment Museum, American Visionary Art Museum, Babe Ruth Museum, Port Discovery Children's Museum, and other landmarks. Each year, a wide range of events are held in and around Baltimore's Inner Harbor area. Among the most popular are Tall Ship Visits, Baltimore Book Festival, Parade of Lighted Boats, and many others. Visitors to the Inner Harbor will also find a wide range of hotels, restaurants, shops, marinas, and services. Although the Inner Harbor is a highly urban setting, visitors are often surprised to see wildlife. Surrounded by native plant gardens, the saltwater harbor attracts waterfowl, shorebirds, songbirds, fish, and other wildlife.